Being a DJ used to be an exclusive, secretive art, requiring hours of hanging around record shops, harvesting records, contacts and knowledge, and even longer religiously slaving over the turntables perfecting your mixing and scratching technique. Expensive equipment, space to set it all up and literally tons of vinyl were once the only way to go, and awesome as all that was - and honestly still is - in 2016 things have moved on considerably. 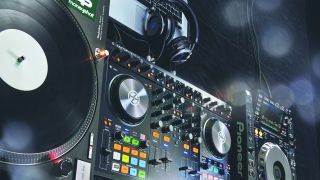 Although there are those who still claim that to be #RealDJing you need to be rocking out on twin Technics and a mixer, the rise of digital music has totally transformed the way people DJ now and has the potential to bring in a new wave of people not into desperately hoarding and hoovering up every square inch of vinyl they can find. Chances are, if you go and see a DJ play today, they will be peering out at the crowd over the top of a laptop screen rather than digging through a record bag for the next tune. The laptop long ago became the weapon of choice for professionals; the lone glowing apple of a MacBook Pro, shining out of the dark, through a haze of smoke and lasers, is a common sight in clubs around the globe. There is a variety of different DJing software available today - some new, some which has been around for years - and it all does essentially the same job, allowing you to mix two or more digital music files together. Traktor, Serato, Virtual DJ, Rekordbox - there's plenty to choose from. And the great thing about this is that while generally only those real DJ's have decks, generally most people have a laptop. And that means pretty much anyone can have a proper crack at being a DJ. Using a laptop controller is actually one of the most common ways to play these days, with controllers coming in all shapes and sizes. Controllers do just that, control software running on a laptop, or even on a tablet. Starting out with a simple compact two channel controller, like a Pioneer DDJ-WeGO3 or a Numark mixtrack, means you can always upgrade to something more versatile and professional like the Traktor S8 if you decide you need more in the future. There are loads of great controllers available to get you started for bargain prices. Laptop mixing isn't the only way, though. These days you can get apps that come pretty close to what pro DJing software can do running on your phone or tablet, such as Cross DJ, DJAY 2 or DJ Player. And with the inexorable rise of online streaming services that means you can have access to millions of tracks within them. This ease of access and unprecedented portability means that you can DJ now in places and situations that were simply impossible before. Got a two hour train journey? Nah, you've got a two hour mixing session. The rise of digital DJing hasn't killed off the original approach though, far from it. Vinyl sales have risen to a level not seen since the mid-nineties and Panasonic is resurrecting the classic Technics SL-1200 turntable this year. And Sony is releasing its HX500 turntable this year which will allow you to easily rip all your vinyl, using its built-in DAC, in the highest of high-resolution audio files. And if you're genuinely serious about learning the finer points and taking up DJing then you really can't beat two turntables and a mixer. You aren't even just limited to playing actual records on your decks these days either. With a digital vinyl system (DVS) you can actually control the digital tracks your laptop software is playing using special timecoded vinyl. So you can still look and feel like a superstar DJ despite your vinyl collection being dwarfed by your online library. If you don't want to use a computer at all there are also CD decks and dedicated digital music players which can be hooked up to a mixer instead of record players. Most modern players, like Pioneer CDJ's, can be used with USB sticks as well, and these are way easier to carry around to parties than hulking bags of vinyl. Finding music is a totally different ballgame these days too. Gone are the day of hanging around in record shops eagerly trying to befriend the staff in the hope they'll put aside some white labels for you before they go out on the shelves, or trawling through boxes of awful rubbish in dusty basements searching for that rare second hand gem. These days you can do all your music shopping from the comfort of your sofa. The online vinyl market is huge - eBay actually pushed the value of second hand records right up when it first became popular in the late 90's, and you can still find loads of rare and classic tunes on there today. Sites like Discogs let you search by artist, see their entire discography and then see who has their music for sale second hand. Then you've got Beatport, Trackitdown and Juno Download which offer digital tracks of every genre imaginable in varying quality, as well as the stalwarts like iTunes, HDTracks and loads of other sites. The way people listen to music is changing, and as a result the way people DJ is changing too. Streaming has become the most common form of music consumption and the ability to mix tracks directly from streaming services like Spotify, Deezer, Soundcloud and Pulselocker is now being built into DJ software. In a few years the idea of actually buying and downloading individual tracks will probably seem strange when you can have access to millions of tracks for just a tenspot a month. DJing has never been easier to get into. The technology available today means you can get started without spending a small fortune. With your MacBook, a Spotify subscription and a controller you can start mixing it up like a pro instantly. And if you do love your expensive gear then a full top of the range set up including decks, mixer, CDJ's, headphones, monitor speakers, effects units and, of course, the ubiquitous MacBook Pro, will set you back thousands. And that's before you've spent a penny on tunes. If it really works out for you it could be a whole new career - if you can handle all the late nights, loud music and inevitable tinnitus. That said, getting gigs doesn't necessarily mean playing big clubs. House parties, nights down the local, even weddings and bah mitzvahs can be good little earners. It's not all about making money though. DJing is a huge amount of fun and nailing that perfect mix immensely satisfying. Playing music you love to other people that love it too is one of the best feelings in the world. Pull those headphones on and focus into your own little musical world or get your mates over - a DJ setup makes for a much better focal point for your lounge than pointing all the furniture at the television. So if you are remotely into your music, especially electronic dance music, it's literally never been easier or more affordable to get into. It can be a hugely rewarding and involving hobby, and you never know, you might turn out to be the next Tiesto.